I want to let you know that there’s only one person who controls everything in Abra. She calls herself Ms. X. Every Abra Mayors dread her. Contractors and vendors knew here very well. Si Ms. X walang kahihiyang mag de-demand ng 50% cut sa mga projects sa Abra. Hindi ko ma-imagine na magagawa nya yun. Kaya wala nang natatapos na proyekto. Yung nasira na building sa ospital hinding hindi na matatapos kasi wala nang pondo. Kagagawan yan ni Ms. X.
Bakit sinasabi ko ito? Para malaman ng mga taga Abra na dahil kay Ms. X madaming proyekto na walang napuntahan. Please stop Ms. X for a better Abra. Parang Pinoy Henyo to ah…Ms X…..maputi ba ‘to?… mataba ba ti?… singkit?….mahaba buhok? …taga Bangued? ahhh HAYOP?.. Mamsaang girl is now the richest woman from penarubia , kawawa na talaga mga taga Abra wall Ng mapuntahan with the combine corruption of the husband and wife tandemn greediness and the reason why Abra is in mountain of debt. wen isu basta I_________g feelers kasi! andy mentioned “mamsaang” di pay apelyido ni ruby nga asawa ni gob takit idi balasang pay. apayen ander de saya ngaminen aya ni gob takit’en? adda met ah lategna ni sir gob. takit ti man lang madaldalamintang mon andy. wow this is such BS! Cia rin ba ang contractor ng kalsada jan sa patucanay bangued going to tayum? ilang buwan plang binabakbak na agad kc sub standard ang gawa? Is she the one they call the gobernadora? I heard they collected a lot of wealth for just 6 years in power. shame on you! I wonder why she wants to be called Ms.x? what does it mean? x-rated? x-tra curricular activities? x-tended warranty? x-tra 50%? yot da puta nat tan!!!! FYI: para ti impormasyon ti amin jay concreting ti Tayum ket paimplementar ti DPWH under ken Cong.Joy Admin. Kwarta garod ti DPWH dayta or ni Cong Joy? Di ba obligasyon da nga sementoen data nga kalsada? Kwarta ti tao dayta isunga dim ipalastog no adda sangkabassit nga accomplishment mo/yo/da. Obvious naman na si Ms. Ruby Bersamin ang Ms. X. Meron ako kilalang contractor sa Abra na nag-backout pag nalaman na dadaan ka kay Ms. X para maka bid sa projects. Walang kahihyang 50% agad ang dapat ibahagi. Ang balita ko, very defensive si Gobernador at Gobernadora pag tinatanong kung saan nila nakuha ang pera para mag-patayo ng napakaling bahay sa Penarubbia. Ang laging rason eh pensionado naman daw si Gob sa America. Pero magkano na lang ba ang nakukuha ng isang retired sheriff? sheriff? bassit ti sweldo na ket siakto pay nga adda iti FBI senior inspector diak pa ma afford dan ti agbalay iti mansion dita abra. hay apo ketdi, talaga nga nasirib daytoy nga ansisit………ammo na ti pomorsyento 50 porsyento pay ti alaen na akas royalty annia ket ti biaggen ditoy ABRAN! TO THE NAME ‘WITH-HELD’ by the A.com Administrator:..
SIR, when you mentioned about the Abra Provincial Hospital being UNFINISHED because of insufficient funding, I am deeply disturbed … Abrenians were informed that the Hospital received its funding from the Government. I’m here (DR. LEO) to REMIND GOV. TAKIT, that the first Abra Provincial Hospital is the ‘LEGACY’ the late Gov. Dr. Luis F. Bersamin,Sr. left to the people of ABRA. by profession, soon after WW II he had to improve the declining health care of the entire Province… the best he knew (I believe)…is by creating the Provincial Hospital for the people. I believe that the New Hospital must be constructed per architect’s specifications, with the hope that it will last for a long time to serve the people of Abra. I must know the current status of the Hospital because I’m about to send as my donation to the Hospital a No. 2 Balikbayan Box(BBOX) as I did the BBOX No.1 addressed to Gov. TAKIT last year. and (two-new)Electrogram Machines (Heart-Tracing) – sterilizers included. its very good doc that the truth came to your senses. the political families majority amasses funds from the government sector and that to include the first couple in abra, what a shame doc and what you sent bbox was to help us the people but instead the people you entrusted comes out to be one of those rotten evils depriving its constituents privileges help from good hearted person like you doc. a person like you doc is what we needed to lead us. A Reply to JOSEF’S Posting of October 28, 2012:..
Josef, Sir… thank you for your honest assessment that I could be the right leader for the Abrenians. No thank you, I’m too old for the job as a ‘leader’… I’d like to leave the job to the younger generation. Josef, are you calling from Bangued… if you are…Pls do me a favor, tell us your Kababayans via the A.Com any information about the New Abra Provincial Hospital…> Abra Memorial Medical Center (AMMC). It’s possible that Gov. Takit is busy in his job as a Governor, too busy to drop me a line stating that he had received the Balikbayan Box (BB) No.1, I sent last year(Mar.2011). If Gov. Takit is connected to the A.com, I want to inform him that I have sent BB NO.2 last month addressed to the Governor. The BB No.3 will be sent in a couple of months. (THERE IS DELAYED IN GETTING BB BOXES). HEAD – NECK – CHEST (LUNGS) – ABOMEN( Stomach- Intestines – Colon)- Pelvic Organs. To the CEO (Administrator) of the Provincial Hospital…> Sir, does Bangued have qualified Surgeons? If you have good surgeons, they can make used of the surgical instruments. TO CEO, Sir, I have asked you if Bangued has qualified surgeons..meaning…> surgeons who have submitted their credentials- training to the CEO (Administrator) for approval in order to use the Surgical Facilities of the Hospital. Josef. thank you for your posting. If you run across the Hospital CEO please tell him to contact me via the Abreian.com. wala ng maganda sa abra., we the youth, only is the hope, except the sons and daughters of present politicians, baka dumaan na naman sa political dynasty.. dadaan na nga eh, haharangin pa.! huwag ka! AUTHORED AND WRITTEN BY: Dr. Leo Tuason. I’m saddened and deeply disturbed when I (Dr.Leo) learned from the Abrenian.com Website that the younger generation of Bersamins are having ‘behavior’ short of what the people expected them (Bersamin) in Government Office to have…that is ‘integrity’, pro-people and ‘well behaved’ – behavior in accordance with strict code of moral values’. Integrity above reproach is hard to acchieve nowadays. YES IT’S TRUE, as the saying goes;…”Behavior changes with the changing times”. I hope the good behavior remain!!! I can’t help but reminisce about the ‘good old days’ when every thing is simple. I can recall the older generation of Bersamins who have served the people via Government offices, fully aware that they are only ‘temporary’ stewards of the province … and being temporary in status they can be removed from office by majority of votes. I can recall the older generation of Bersamins whose ‘integrity’ was beyond reproach like..
1. DON. HONORIO BERSAMIN the 1st progenitor of the Family Bersamin. He was married to Dona Romana Villamor. These were Dr. Leo’s grandparents. Don Honorio was a land owner and pilanthropist. He donated hectares of his land west of Bangued, when in early 1920’s the community needed land to build the highest Academic Institution of the province at the time. Incidentally, after the American – Filipino Conflict of 1900 to 1902, the American Government established the early educational system in the Islands. In Bangued, they built the long Building east of the Plaza …this was the LONG BUILDING and was made as the EAST CENTRAL ELEMENTARY SCHOOL… this was the grade school I (Leo) attended. after 1 year of Kindergarten to the 1st year of grade school at the Catholic School. Kababayans, have you passed as students through the Academic Portals of the Abra High School? If you have, then, you’ve been touched by the ‘legacy’ of Don Honorio Bersamin to the people of the province of Abra. To be Continued:.. Ohter Bersamins in the Government. BARRAG, INSTI, KARRUBA & MALADAGA). 1. Don Honorio Bersamin. (previously mentioned). 2. Don Longino Bersamin. Oldest son of Don Honorio. Married to Maestra Isang Ferraren. > Don Longino was twice elected as Mayor of Bangued (in the late 1920’s and early 1930’s). He was responsible in the initiation-creation of the ‘water supply with faucets’ in every household in the municipality of Bangued. The abundant supply of water comes from the crystal-clear spring water of Lusuac Penarubia, at the time owned by Don Longino’s cousins… Don Ignacio Villamor (1st President of Univ. of the Phil. and later became the Chief Justice of the Phil. Supreme Court) and Don Julio Villamor Borbon (was Abra Governor early 1930’s and initiated the construction of the ‘Tangadan Tunnel’ at the border of ILOCOS SUR and ABRA). Both cousins Dons Ignacio and Julio gave the water to the Bangued people ‘FREE’. Allow me to trace the route of the water from source Lusuac to Bangued, through Cosili thence to Casamata Hill of Bangued where the water is received by a huge cement water reservior located at the summit of the Hill, where the statue of ST. MARY now stands. It took me a long time to figure out how the Lusuac water reached Bangued without electric-pump during the time, how to propel forward the water. Yes, natures way…. the Romans did it. They knew the source of water for the city of Rome to create their ‘water fountains’. Water came from a higher source. Through a system of ‘aquaducts'(acting as pipes) the water is channeled to the City of Rome. The force to propel the water from source is created by difference of height (higher source and to lower City of Rome) plus gravity creating a ‘water head-pressure’ to cause the water fountains to function!!! How ingenious these Romans were. Michelangelo never had ‘electric-pump’ at the time. husto ta konam triplexxx ta dagidiay kakaanakan ni gobernadora pena ruby nga mayora ging ging mamsaang-balbuena, kapitana jane “baby” mamsaang-cecilia ken kabsatda pay lalaki sanguniang ket ultimo panangiyutangda ken panagibay-onda kwarta penarrubia…..agpipinnadakkel ken agpipin naadoda ti balbalay, luglugan ken dagdaga haanla nga idiay penarrubia, pati diay manila ken baguio. samantalang idi ket naka chap chap lang motor ta madida kabaelan gumatang uray second hand nga lugan…………kakaasi la agpayso ti abra pagbagbagasanda! 3. Dr. Luis F. Bersamin, Sr. married to Pharmacist Ms. Rosario Purruganan daugther of the late Governor of Abra Eustaquio Purruganan. Dr. Luis was the second oldest son of Don Longino. He was a WW II veteran of the Phil. Medical Corp and Survivor of the Bataan Death March. Dr. Luis became the first Governor of Abra after World War II. As the Governor of the province, Dr. Luis’s first project was the building of the Provincial Hospital (APH) (his ‘legacy’ to the people of the province). After the War, he saw the deteriorating ‘Health’ situation of his constituents. He asked his cousins the Tuasons Meno and Moises who were in the Logging-lumber business at the time to ‘bid’ for the construction of the Hospital using their lumber… The Tuasons won the ‘BID’, the older Meno stayed to oversee the Construction of APH while the younger Moises went back to the high mountains of Abra to resume the Logging-lumber business. After his term as Governor, Dr. Luis left the GOVERNORSHIP (one term only) he returned to the practice of Family Physician his first love. By the way, shortly before WW II, I Leo used to carry his medical bag for 10 centavos which was a lots of money then for a youngster when he made his rounds in the municipality of Bangued to see his patients from Linasin (north), Lalaud (west), sinapangan (south), barikir, (east) which usually took the whole day. What a joy I had for the 10 centavos and the Medical Bag had endeared me to the Medical profession. 4. Mr. Luis P. Bersamin, jr., went by the name of ‘CHITO’, married to Ms. Evelyn Mayor. Divorced after having three children … Charito, Mary Ann & Michelle, and remained single. At a time of political turmoil during the dark years of the province, he became the Mayor or Bangued then became the Congressman for the Province a much contested office at the time… Chito got the mandate of the Abrenians but time was not to his favor… his life was cut short by assasin’s bullet. In 1997, I took my family to visit Bangued My family consisted of an American wife and four young adult children. It was the time I saw cousin Manong Luis ‘bed-ridden’. 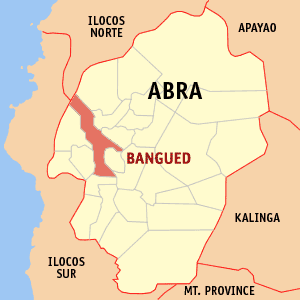 It was the darkest ‘political era in the province of Abra’, the first time I heard Bangued as being the ‘killing field of the Northern Luzon’. Manong Luis confided on me, he said this he adviced his son Chito “To lay low and not to antogonize the incumbent administration”. Cong. Chito was the oldest son of the late Gov. Luis F. Bersamin, Sr. Chito remained single after his divorce till his untimely death in the early 2006. In 2005, my last Bangued visit in months of February to March… I stayed at his residence in the old Purruganan Ancestral House… and had evening conversations with him after hectic days in the Congress. I noticed disatisfaction in his voice regarding his status as a Congressman because he can not implement his ideas to bring forth betterment of the province. In order to do the job, he said, “I must be the Governor”. and you uncle shall be my adviser from distant USA, he added. At this point, I reminded him about the advice of his Father, ‘Not to upset the cart’. Regarding Chito’s contribution to the Abrenians. Recorded are water supply to several communities he sponsored using money allocation from the Congress, put up-built in the form of artesian wells. Another was the bridge at SOOT RIVER in the southern Abra. These are his ‘legacy’ to the people of the province. Dr. Luis F. Bersamin, Sr. He was voted to the Governorship soon after the death of his older brother Cong. ‘Chito’. Don Longino… Mayor,>> Dr. Luis, Sr… Governor,>> ‘Chito’ Luis, Jr…Congressman. His constituents blames him (Takit) for exercising poor executive judgements…Claimed to have acquired proved or unproved accomulated wealth not commensurate to salary or investments (USA or ABRA). Folks, these accusations, please present proofs, documented proofs, not hearsay-gossip. Many of your kababayans believed that you TAKIT is under the ‘saya’. All informations mentioned here are obtained from the Abrenian.com Website. I know FOR A FACT that Don Longino, Dr. Luis and Cong. Chito never, never ENRICHED themselves while they were in Office!!! and I know the wives of Don Longino and Dr. Luis personally, they were of ‘ILOKAN HERITAGE’. They remained just plain housewives and never allowed Abra people call them MAYORA or GOVERNADORA …meaning not involved in the government activities or functions. I have never met personally Mrs. Ruby Mamsaang Bersamin. All I know about her is that she is from Penarubia, Abra. Thank you for educating us on the History of the Bersamins. I will post your write-up in a separate story. This is definitely a piece worth reading by all Abrenians. You are very stupid. Why do you even bother posting something like this? You have accomplished nothing, quite possibly your life is nothing. Nde ako tga abra. Nde rin ako ilokano, perk Kung mag p-post ako at least yung ilalagay ko it makes sense. Bum alum ka na as pay titinda ng Lechon manok at yang any paborito long pagkain. Galingan mo ah. Atsaka wag mo kakalimutan yung mang Tomas. Paano maii-stop yan kung ayaw mong ibunyag ang pangalan ng Ms X na yan?? Asawa ata ni Gov. TAkIt?